Have you ever paid an excess baggage fee, left your passport at home or cleaned up a messy shampoo spill in your suitcase? 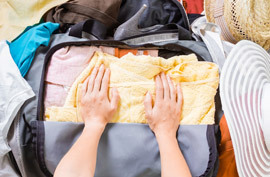 If you've encountered any of these packing crises, chances are your suitcase-stuffing strategy could use a little work. To help your trip preparation go more smoothly, we've pinpointed the warning signs of four common packing problems and identified a few easy, effective solutions for each. Who wants to waste time slaving over a steaming iron at your hotel when you could be out exploring a new destination? Occasional wrinkles are an occupational hazard of traveling, but if your clothes come out of your suitcase looking like they've spent weeks in the back corner of your closet, it may be time to reevaluate your packing strategy. Stick to wrinkle-free clothing rather than ordinary cottons and linens, which are prone to creases. You can get wrinkle-free garments from travel suppliers such as Magellan's or TravelSmith. When you go to lay your clothes in your suitcase, don't simply fold and crease each garment individually -- that's a recipe for wrinkles. Experienced travelers use a variety of packing methods, including rolling (which works particularly well in backpacks or duffel bags) and interlocking (folding multiple garments together so that they help cushion each other against wrinkles). Other travelers swear by tissue paper or plastic as a buffer between layers of clothing. There's nothing worse than arriving home only to find that the gorgeous blown-glass vase you bought in Murano has been reduced to a pile of colorful shards in the bottom of your suitcase. Travelers who've suffered the loss of a favorite souvenir or had clothes ruined by a messy spill may need a few lessons in packing with extra care. It may seem obvious, but it bears repeating: never put breakable items into your checked luggage. Instead, wrap the items carefully in newspaper, bubble wrap and/or clothing and stow them in your carry-on bag. Smaller items can be slipped inside a shoe and cushioned with a balled-up pair of socks. If you're buying a fragile item that's too big to fit into your carry-on, have the merchant ship it home for you. Stores that frequently handle tourist purchases are pros at packing their goods for shipping -- and you'll often be able to insure your item and receive compensation if it's damaged en route. packing suitcase vacation trip No, we're not talking about emotional baggage! We're talking about the carry-on bag that takes two flight attendants plus a body builder to lift into the overhead compartment, or the suitcase that's stuffed so full you have to enlist your children to sit on it before you can zip it closed. We don't need to remind you of all the perils of overpacking -- excess baggage fees, anyone? -- so if this is your major packing weakness, read on to learn how to lighten your load. Start at the source: your suitcase. If you often find yourself edging toward your airline's weight limits, it may be worth purchasing a lightweight bag to give you a few extra pounds to work with. Do your homework to prevent packing unnecessary items. If the weather forecast calls for nothing but sunshine, leave the umbrella at home -- you can always buy one if you get caught in an unexpected shower at your destination. Call your hotel to ask what amenities will be in your room; odds are you won't have to pack your own shampoo, soap or hair dryer. Pack clothes that can do double duty -- like black shoes that are comfortable enough for sightseeing but dressy enough for dinner, or a shirt that can be worn twice with different accessories. Stick to neutral colors so your garments can easily be mixed and matched. Take your suitcase for a test drive. Pack it with everything you want to bring and then walk with it around the block. If you're huffing and puffing after a quarter-mile, chances are you've packed too much -- and there will be a few items in your suitcase that suddenly seem less essential. Do you lie awake the night before a trip, terrified that you've forgotten to pack something vital? Or, even worse, do you arrive at your destination to find that you actually have forgotten to pack something vital? Pre-trip panic is often a sign that you haven't done enough preparation for your trip -- or that your preparation was too rushed. Staying organized and giving yourself plenty of time to pack will help cut down on your pre-trip anxiety. Don't wait to start packing until the day -- or the hour! -- before your trip. 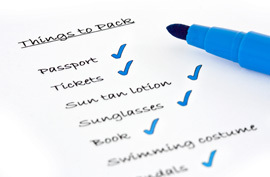 Instead, begin making a list of items you think you'll need about a week prior to departure. Starting early will give you time to go shopping for any items you may be missing. Use this interactive packing list from The Independent Traveler to jog your memory about items you may have forgotten. Finally, keep your worrying to a minimum by remembering that outside of a few admittedly vital items -- such as prescription medications and your passport -- there are few things you can't purchase on the road if you forget to pack them.